Rear admiral is a naval commissioned officer rank above that of a commodore and captain, and below that of a vice admiral. It is generally regarded as the lowest of the "admiral" ranks, which are also sometimes referred to as "flag officers" or "flag ranks". 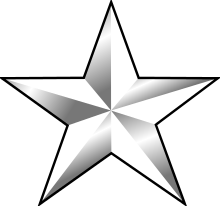 In many navies it is referred to as a two-star rank (OF-7). It originated from the days of naval sailing squadrons and can trace its origins to the Royal Navy. Each naval squadron would be assigned an admiral as its head, who would command from the centre vessel and direct the activities of the squadron. The admiral would in turn be assisted by a vice admiral, who commanded the lead ships which would bear the brunt of a naval battle. In the rear of the naval squadron, a third admiral would command the remaining ships and, as this section of the squadron was considered to be in the least danger, the admiral in command of the rear would typically be the most junior of the squadron admirals. This has survived into the modern age, with the rank of rear admiral the most-junior of the admiralty ranks of many navies. In some European navies (e.g., that of France), and in the Canadian Forces' French rank translations, the rank of rear admiral is known as contre-amiral. In the German Navy the rank is known as Konteradmiral, superior to the flotilla admiral (Commodore in other navies). In the Royal Netherlands Navy, this rank is known as schout-bij-nacht (lit. : supervisor during night), denoting the role junior to the squadron admiral, and fleet admiral. The Royal Australian Navy maintains a rank of rear admiral; refer to Australian Defence Force ranks and insignia. The abbreviation is RADM. Since the mid-1990s, the insignia of a Royal Australian Navy rear admiral is the Crown of St. Edward above a crossed sword and baton, above two silver stars, above the word "Australia". Like the Royal Navy version, the sword is a traditional naval cutlass. The stars have eight points, unlike the four pointed Order of the Bath stars used by the army (which are often referred to as "pips"). Prior to 1995, the RAN shoulder board was identical to the Royal Navy shoulder board. The Royal Navy shoulder board changed again in 2001 and the Australian and UK shoulder boards are now identical except for the word "Australia". Rear Admiral Robyn Walker AM, RAN became the first female admiral in the Royal Australian Navy when she was appointed Surgeon-General of the Australian Defence Force on 16 December 2011. In the Royal Canadian Navy, the rank of rear-admiral (RAdm) (contre-amiral or CAm in French) is the Navy rank equivalent to major-general of the Army and Air Force. A rear-admiral is a flag officer, the naval equivalent of a general officer. A rear-admiral is senior to a commodore and brigadier-general, and junior to a vice-admiral and lieutenant-general. The rank insignia for a rear-admiral is two silver maple leaves beneath a silver crossed sword and baton, all surmounted by St Edward's Crown, worn on gold shoulder boards on the white short-sleeved shirt or the tropical white tunic. The service dress features a wide strip of gold braid around the cuff and, since June 2010, above it a narrower strip of gold braid embellished with the executive curl. On the visor of the service cap are two rows of gold oak leaves. Canadian rear admiral sleeve insignia (since June 2010). Shoulder boards for short-sleeve shirt, tropical white tunic and white mess jacket. Konteradmiral is an OF-7 two-star rank equivalent to the Generalmajor (en: Major general) in the German Army and the German Air Force. The Guyana Defence Force Coast Guard is the Naval component of the Military of Guyana. As such, the ranks of the Coast Guard are naval ranks similar to the practice in the respective Coast Guards of Jamaica and Trinidad and Tobago. The rank of rear admiral was first awarded to chief of staff commodore Gary Best on August 19, 2013. The rank insignia consists of two silver pips with green highlights, beneath a crossed sword and baton (also silver colored), all surmounted by the gold-colored Cacique's crown with red, and green highlights. The Indian Navy also maintains a rear admiral rank senior to commodore and captain ranks and junior to vice admiral (and admiral) ranks. The rank insignia for a rear-admiral is two stars beneath crossed sword and baton, all surmounted by Emblem of India, worn on shoulder boards. The Iranian Imperial Navy (IIN). The Islamic Republic of Iran Navy (IRIN), also known as the Iranian Navy. Pakistani rear admiral rank insignia. A rear admiral in the Pakistani Navy is a senior and two-star rank naval officer, appointed in higher naval commands. Like most Commonwealth navies, the rear admiral rank is superior to commodore and captain. However, the rank is junior to the three-star rank vice-admiral and four-star rank admiral, who is generally a Chief of Naval Staff of the Navy. The highest ordinary rank currently filled in the Royal New Zealand Navy is rear admiral and this is the rank held by the Chief of Navy unless that person is also Chief of Defence Force. The Republic of Singapore Navy uses two ranks with the title of rear admiral: rear-admiral (one-star), a one-star rank; and rear-admiral (two-star), a two-star rank. The Royal Navy maintains a rank of rear admiral. Note that the rank of rear admiral is quite different from the honorary office Rear-Admiral of the United Kingdom. 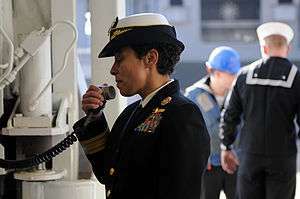 US Navy Rear Admiral Michelle J. Howard uses the public address system to address the crew of USS Wasp in 2009. Howard has since been promoted to admiral. 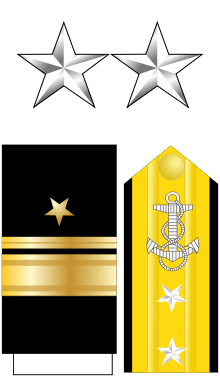 In the United States since 1984, there have been two ranks with the title of rear admiral: rear admiral (lower half) (RDML), a one-star rank; and rear admiral (upper half) (RADM), a two-star rank. Prior to that, a combination of ranks were used. In Vietnam, the equivalent to rear admiral is the chuẩn đô đốc or đề đốc. ↑ "Uniform Ranks". Royal Australian Navy. Australian Government. Retrieved 17 April 2016. ↑ "First female Admiral for the Royal Australian Navy". Defence News. Department of Defence, Australian Government. 6 December 2011. ↑ "Rear Admiral Jack Steer Appointed Chief of Navy". Royal New Zealand Navy. Royal New Zealand Navy. Retrieved 15 November 2014.